Site visitor makes a request with the URL, ex. : http://www.yourdomain.com/index.php?url=pages/view&id=1 and the Web server handles the request by executing the bootstrap script index.php. The application receives a user request information from the framework component named CRequest. The application determines the requested controller and action. 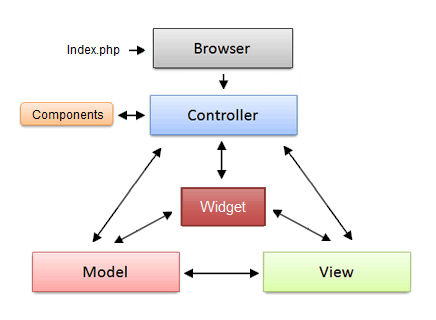 For this example, the controller is pages, which refers to the PagesController class; and the action is view, whose actual meaning is determined by the controller. 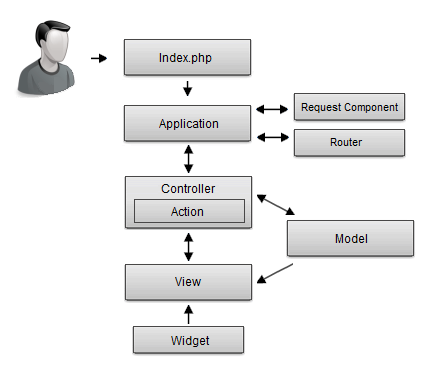 The application creates an instance of the requested controller to handle the user request. The controller determines that the action show refers to a method named viewAction in the controller class. The action reads a Pages model record whose ID is 1 from the database. The action renders a view named view with the Pages model. The view reads and displays the variables passed from controller. The view may execute widgets. The action completes the view rendering and displays the result to the user using defined templates or layouts.